Many virtual charter school parents believe they are “homeschooling” their children. They cite the fact that their students are learning in the home rather than in “brick and mortar” schools. They see their ability to choose from a variety of state-approved curriculum options as giving them control — at least enough control — over their children’s education. 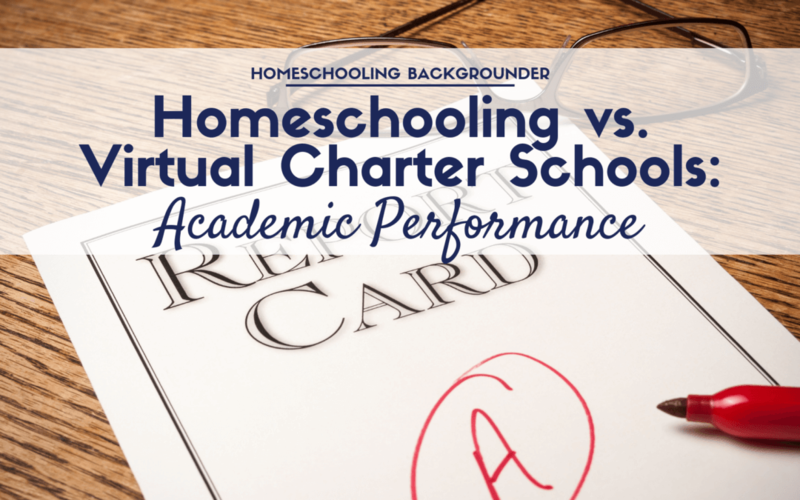 In this article, we will compare the academic results of virtual charter schools with the academic results of homeschools to see if the two groups’ results look similar. We look at the three states where we have data on homeschool test scores: Arkansas, Idaho and Oregon. The tests homeschoolers take are norm-referenced tests. They compare the student’s academic standing with other students nationally. The 50th percentile score is the national average. Because public schools educate 88% of students nationally, the national average provides a useful approximation to the public school average. Norm-referenced test scores are not directly comparable to criterion-reference test scores. But we want to compare homeschool academic achievement to virtual charter school achievement. Our research strategy will be to compare the norm-referenced homeschool averages to the norm-referenced public school averages, and the criterion-reference virtual charter school averages to the criterion-reference public school averages. The comparatively small number of virtual charter school students do not materially affect the public school averages. The public school average achievement level, as measured by both types of tests, will be the common link between the norm-referenced scoring and the criterion-reference scoring. So we will be able to clearly compare homeschool academic achievement levels with virtual charter school achievement levels. Note that we are comparing the academic results of homeschooling as a method of education with the academic results of virtual charter schools as a method of education. We are not talking about the academic performance of individual students, per se. The arrow figure at the right shows the comparison logic. We do not attempt to directly compare percentile rank with percent passing. Instead, we compare both methods of education to the baseline of public school results. Arkansas homeschools have better academic results than public schools (61 vs. 54). Arkansas virtual charter schools have worse academic results than public schools (46.4 vs. 53.6 and 36.6 vs. 48.2). 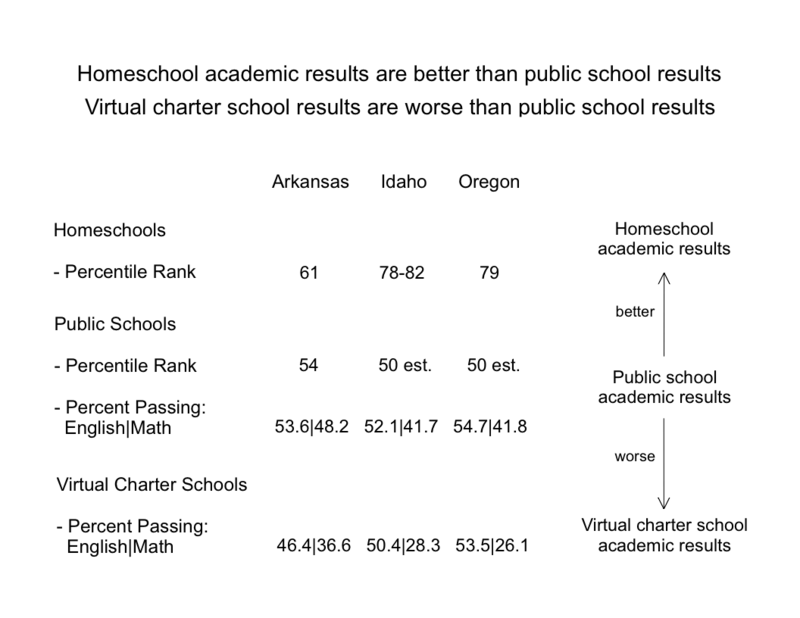 Thus, Arkansas homeschools have clearly better academic results than Arkansas virtual charter schools. For Idaho and Oregon, we used the national average (50th percentile rank) to estimate the Idaho and Oregon public school average scores on standardized tests. The homeschooled students score substantially better on standardized tests than the public school students in both Idaho and Oregon. In both states, the virtual charter school results on the statewide English assessments are almost as good as the public school results. But the virtual charter school results for Mathematics are clearly worse in both states. Homeschool academic results are better than public school results. Virtual charter school results are worse than public school results. So homeschool academic results are distinctly better than virtual charter school results, according to the data. Homeschooling parents deliberately choose to take responsibility for the education of their children, controlling both the education process and the curriculum (course of study). With that commitment they often embark on a cascade of changes within themselves, changes in how they regard themselves and their children. What these parents become may make the difference in how their children do academically. For instance, their commitment to academic success may cause them to be more involved in teaching their children. The reasons parents choose to utilize virtual charter schools may inherently predispose the family to worse academic outcomes. For instance, if the parents want a school to have the responsibility for education results that may mean they expend less effort themselves in teaching their children. There are other potential factors, of course. This is an area for further research. Homeschooling and virtual charter schools have different academic outcomes. We need a separate category to distinguish between the two methods of education. I use Public School at Home to describe virtual charter schools. Data sources: Arkansas Department of Education, Idaho Department of Education, Idaho Coalition of Home Educators and Oregon Department of Education.